This is very much a case of do as I say, not as I do. We are all well aware of the dangers of travel photography. I often like a wingman/wingwoman/wingperson to watch my back in a strange place whenever Im concentrating on camera stuff and actually taking photos. Its either that or the one setting get the camera out take the photo and put it back again which never really does the job properly.Having been brought up in a rough area I like to pride myself on seeing and recognising a hood/crook/criminal no matter where I am in the world but it always pays to be careful. The less time an expensive camera is on show the better. One advantage of being rather scruffy in general is that people tend not to bother you. Its particularly good when you look like you havent eaten in a while. My dad told me about how he went into London one night and won a lot of money on the dogs, he was standing in the underground early in the morning on a deserted platform with the money in his pocket. A group of guys arrived and my dad having worked in a bookies for a long time knew these guys would be up to no good. So he put 10 pence in his hand and walked across to one of the litter bins on the platform. He bent down and pretended to pick it up off the floor then proceded to go to the nearby chocolate bar machine and buy a bar. He shoved it into his mouth as if he hadnt eaten all day. He looked around and the guys had left, probably thinking he wasnt worth the bother. Theres definitely a lesson there. If you are travelling on your own try to blend in, not get noticed (which is difficult when you are carrying a great big camera), look as if you belong there and you know what you are doing. Dont associate with idiots and canon fodder. What do I mean by that? Well I was travelling with friends by train once through the south of france. It was early in the morning and as we waited to get off the train we were approached by a guy wearing just his socks, boxers and t-shirt. Now at some point you have to feel immense pity, you feel like helping the guy out and taking him under your wing. Alternatively you can just run away and remind yourself of Darwins theories. One other time I was on a bus in Rome and this girl was giving her what I assume was a boyfriend such earache at such a high volume it wasnt hard to be nosey. To cut the long story short they had been walking down this backstreet in Rome which they shouldnt really have been on when he was approached by a beautiful early 20s woman. She walked right up to him with a big kiss and started to fondle his nuts (and I dont mean peanuts). The guy of course was just happy to go along for the ride but suddenly she walked off when another female friend appeared. The girlfriend at the time was too gobsmacked to say anything and our hero was in no fit state to argue. That was until he discovered that his bumbag (fannypack) was empty and hed lost their money, passports, room keys, everything. So for the entire bus journey back to the centre of town he and the rest of the bus was reminded about how stupid he’d been. I cant really describe the look on his face, he was taking a lot of abuse and whilst he showed shame and embarrassment there was still a trace of a smile on his face. So let that be a lesson to you all, either hide your valuables or buy a shedload of cheap wallets from china on ebay, fill them with newspaper cuttings and get a cheap flight to Rome and have the week of your life. So what has all this got to do with photography? Well I did say at the start, do as I say, not as I do. I’ll go back to a recent trip to Rome. 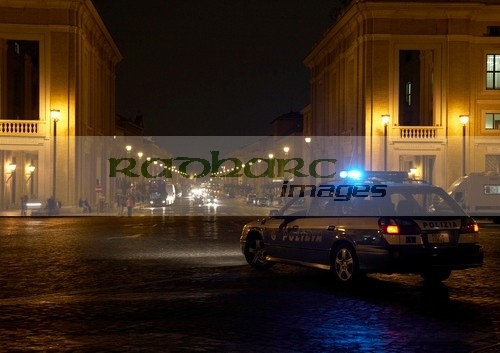 On the last night it was a clear evening so I thought I’d head to the Vatican and get some late night shots of St Peters Square with maybe a few people ghosting through the shots but try to get most without people. 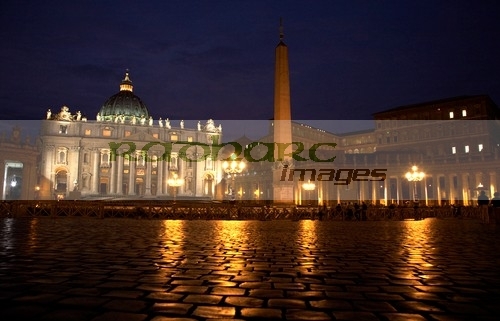 So I got to St Peters Square and as I was travelling light I’d no tripod, so just put my backpack on the ground and put the camera on the top. It was a still night so wind movement wouldnt be a problem so I just attached the cable release to the camera and lay down behind it all to see through the viewfinder to line it all up. At this point I heard some footsteps behind me and thought, oh crap Ive really set myself up as a target here, no way to get up quickly and no-one watching my back. So peered under my arm to see two sets of heavy boots walking towards me. Crap. I then noticed the blue light bouncing off the back of the camera. Suddenly the penny dropped and the next couple of seconds were spent trying not to let my bowels evacuate themselves. Here was me, boots, black combats, black coat, lying on the ground in front of the vatican with a black rucksack in front of me with something sitting on the top of it with a wire trailing to a trigger in my right hand. Hmmm, whatever I was going to do it had to be done slowly….. So if you ever do see me out and about, come up and say hello but it might be worth your while saying it from a distance.